Make sure what is on the screen is the what you’re talking about. Your audience will almost immediately read every slide as soon as it’s up. 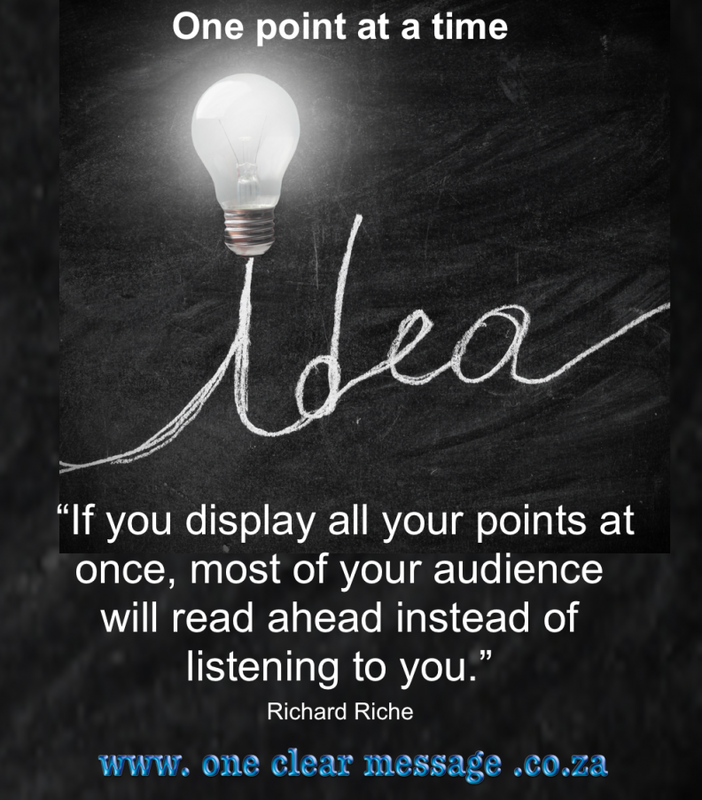 If you display all your points at once, most of your audience will read ahead instead of listening to you. Design your presentation so only one point is displayed at a time. As a presenter, your job is to manage the flow of information and ideas so your audience stays in sync with you. A key failure of many presentations is putting everything the presenter wants to say onto the slides, in huge chunky blocks of text. Microsoft makes different software products for different uses – Word for documents, Excel for numbers and PowerPoint for visual augmentation of your spoken message. Copying Word or Excel documents into PowerPoint will bore your audience and make your message hard to follow. Your slides should illustrate your message, not be the presentation itself. Save the paragraphs of text and bullet points for your script. PowerPoint and Keynote have the option of Presenter’s view to show you your notes without the need for putting them on the screen. Most important for audience engagement, don’t stand with your back to your audience and read it from the screen! Sans serif font. Sans serifs like Arial, Calibri or Helvetica are the easiest to read on the screen. Create contrast. Use dark text on a light background. This is easiest to read in a light room. A dark background is best only when the room is dark. Strong contrast is necessary to make your text legible. If your contrast is not stark enough it becomes hard to read (e.g. grey on black). 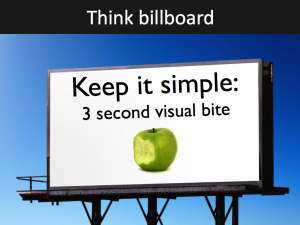 Think Billboard. Avoid clutter, make your message stand out. A headline, maybe an image, a simple (short) quote and simple text (they should be able to “get” your idea in about 3 seconds). Too much information and too many ideas and you risk losing your audience. Beautiful images can be powerful – only if they help your audience get your message. Beautiful images that do not relate to your message can be distracting rather than helpful. Use images only when they help clarify an idea, add important information or make an abstract point more relatable. Don’t use PowerPoint’s built-in clipart, your audience will have seen it all and it looks tacky. Use a prop, pass it around, talk about it, show it or let your audience hold it. The prop can be a product or an object that helps explain an idea (e.g. hats as an analogy of different states of mind). The slides on the screen are only a part of the presentation – you are the main part of the presentation. What you do, say, how you stand, what you wear, how you move all have an impact. A surprising or intriguing opening can get your audience to sit up and take notice. Like a great movie or book, the best presentations hook the audiences early and then reel them in. The most powerful openings are those that appeal directly to the audience. The audience is always asking themselves “Why should I listen?”, “why should I care?” A question is a great way to arouse interest and engage the audience. Ask a question and let your audience think about their answer for a moment before moving on. When you’ve done a presentation before it can be easy to fall into a rote delivery, with only minimal changes to your volume, tone and pace. Use a conversational style, as if speaking to a friend, not as if you are reading the tax code. An engaged and passionate tone of voice make the difference when presenting. If you are a nervous speaker get a coach or join Toastmasters. If you learn your speech off by heart, and then forget a line, it can throw you. Knowing your message is essential, but memorising it word-for-word can cause it to sound rehearsed and stilted. Knowing your content can help you decide what information is necessary to your audience and what can be left out. Knowing your message and content helps your presentation to flow naturally, allowing you to adjust to unexpected questions or events, and get back on point. One of the best presenter tips is to rehearse your presentation out loud (in your head is not the same), accompanied by your presentation. Practicing with your presentation helps prevent timing issues. With presenter’s view you can see your notes and the next slide making your presentation and your timing more effective. It is always helpful to get someone to listen while you rehearse, a coach can help you with message clarity and effectiveness. 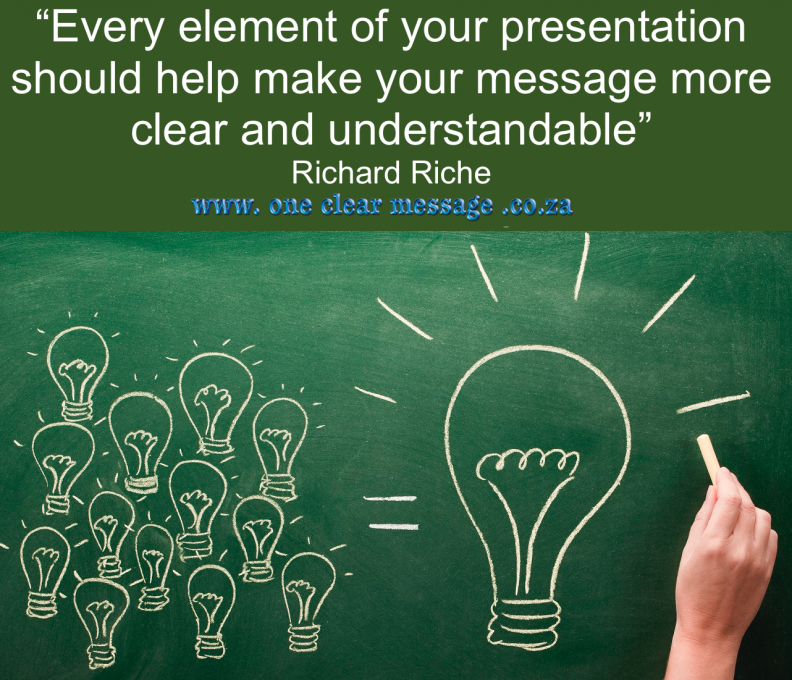 Keep practising until you feel comfortable with your presentation. 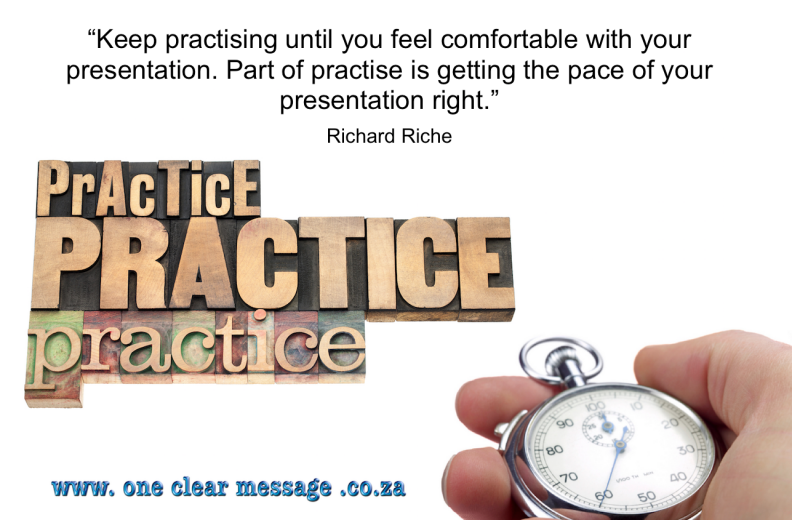 Part of your practise is getting the pace of your presentation right. Time your presentation to see how long you need to talk to each slide. Remember it always takes longer to deliver content in front of an audience. Generally, you should spend about one minute per slide. With time constraints, it is always best to finish your presentation within time. Allow extra time to adjust your pace in case you need to reframe or clarify an idea or concept, or answer questions. Stop bending over the laptop to fiddle with the keyboard, use a presenters remote to advance the slides. You are the focal point of the presentation, using a remote allows for smooth slide advancement without standing in front of the projector. Using the blank button or a black slide allows you to stand in front of the projector without becoming the screen. Often the little red dot on a laser pointer is too small to be seen by most of your audience, rather use animations. You can use an arrow (build in and out) to highlight vital information in your charts or graphs you feel your audience must focus on. For additional detail use a handout and refer to it rather than projecting too much detail to your audience. Arrive early and get to know your speaking area and equipment. Walk around the speaking area, and sit in the seats. Look at the stage from the audience’s perspective. This helps you decide where where to stand and how much you need to project you voice (or if you need to use a microphone). Practice with your equipment (microphones, remotes, projectors) and have a backup of your presentation on a memory stick and a hard copy. Have a look at the lighting to see if the projector is bright enough or f the room lights need to be dimmed. Don’t be the presenter that speaks to the screen instead of the audience. Make eye contact with the audience. Pick a few friendly faces dotted around the room and speak to them (a few on the left, right and in the centre). Speaking to the audience makes it easier for them to hear what you are saying, and keeps them engaged. Powerful presenter tips no/4: If you need help ask. Get help from a professional to design your slides or to give feedback on what is working and what can be improved. If you need help contact us today.